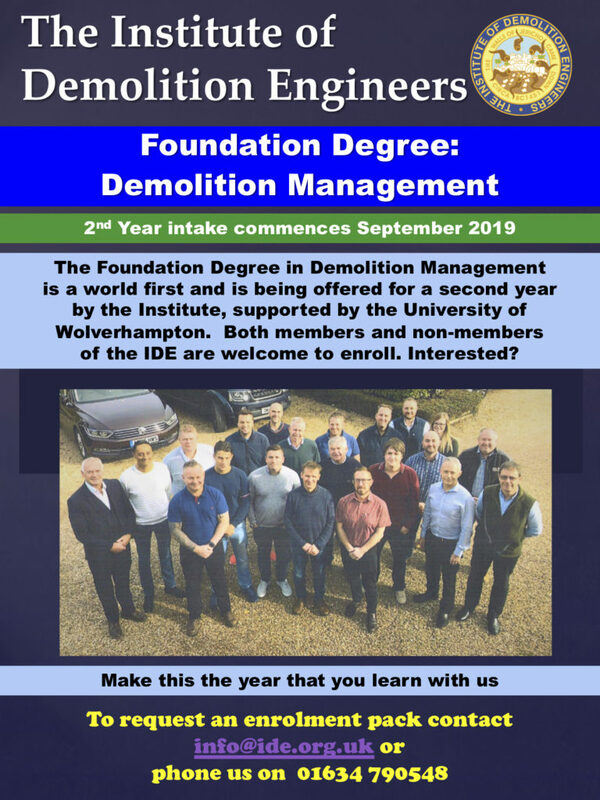 The Foundation Degree in Demolition Management is a world first and is being offered by the Institute, supported by the University of Wolverhampton. The first of it’s kind offered to members and non-members of the IDE. Interested? The Institute of Demolition Engineers extends a warm welcome to all its members, affiliate members and those seeking to extend their knowledge regarding the Institutes activities, both past and present. From what could be judged as a fairly inauspicious start in the early 1980’s. A small number of founder members devoted their time and money into developing a forum in which like minded individuals could bring their knowledge, expertise and ideas to help others in understanding and developing demolition engineering. Today, thirty years on, we have arrived at a time when our Institute is at its strongest with membership numbers increasing year on year and our standing, in terms of equality with other Institutions, being assured. The Institute of Demolition Engineers is a unique entity, being the only one of its kind in the world. Of this we should be rightly proud and not simply because we have led and continue to lead the world when it comes to structural reduction of any kind. The twice yearly seminars, road shows and regional meetings have become a by word in demolition engineering parlance. The annual general meeting and luncheon are historically oversubscribed making it harder each year to find suitable venues in which to further our members cause and attract others to join our growing ranks. The rewards for such membership are tangible and transferable throughout each individuals career, irrespective of the path chosen. Proving competence is one of the key requirements in all industries and when one has achieved full membership of the Institute, you can be assured that it has been the fruition of hard work and many years honing the skills necessary to be a demolition engineer. This Institute was founded by forward thinking individuals who were leading exponents of the industry sector. It is now managed and progressed by similar individuals who will work towards promoting its principles and enhancing the knowledge needed to attain even higher status. We invite you to register your interest in attending an IDE event but we advise you that your place will only be confirmed once you have made payment in full. Payment must be received in the IDE Office at least one month before the event and your place will be confirmed, provided that there is one still available. 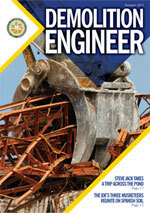 Demolition Engineer is an in-house magazine we publish three times a year. “Wow fantastic news! From my own point of view it will give decent young people a great chance to come in to our wonderful and exciting industry with a sense of purpose and achievement, Set them off in the correct manner and giving young driven individuals the chance to make a difference in our Industry. Demo Expo 2015 was a total success for the UK demolition Industry. Many key Customers visited the Liebherr stand and a few strong sales enquiries were received. In my opinion the UK demolition industry is big enough to have its own trade fair and this was reflected more so this year with a great attendance. The success of the show however is down to the organisers ( NFDC and IDE ) along with the superb facilities and support that J Mould provided.Finally the family day on Saturday was fun with many Liebherr Frisbees getting launched to and from the JCB stand which gave a good giggle! It was nice to see so many youngsters taking an interest in machinery and sitting in cabs of machines…these of course could be the drivers and operators of the future. It also gave us the opportunity to explain the importance of the Liebherr Apprentice Scheme we have running in the UK, we currently have over 40 Apprentices in the UK as it is clear unless we do something now the industry will have a shortage of experience moving forward. Looking forward to Dem Expo 2017 already count us in!! Having recently exhibited our full range of demolition attachments and recycling equipment at the joint NFDC/IDE Demo Expo 2015 at the J Mould Quarry in Reading, we are delighted to report this event was one of the most successful ECY Haulmark have ever participated in, we feel the success of which was largely down to the host and the organisers commitment and dedication to showcasing the best the industry has to offer. The quality of the visitors was second to none on the business day (Friday), whilst it was a delight to welcome the next potential generation of demolition operators, engineers and bosses on the Saturday family day and show them around our equipment and working machines. The Demo Expo has become a major event for people in the UK demolition industry since it’s first show in 2013 and long may it continue to grow, ECY Haulmark will definitely be on board for 2017. I would like to express my sincere gratitude in organising a fantastic event at Demo Expo. Your team were great at putting on such a strong show. I have been exhibiting at shows for 25 years – this is the first time I have ever written a letter of thanks to a show organiser, such is my level of appreciation. You have a winning formula and we look forward to the next show in 2017. For me, being part of the IDE is important as I see it as being a leading light in the recognition of demolition being a skilled profession. The IDE works hard to promote the professionalism of its members in our technically taxing and difficult industry. The IDE provides a good network for keeping up to date with new innovations and techniques. “I have been a associated with the IDE for over twenty years both as a Member and a Fellow of the Institute, I have also served on the Council of Management and until recently have attended numerous Seminars and IDE events. I would recommend Membership of The Institute to all up and coming supervisors, managers and executives working in or associated with the demolition industry, the knowledge that can be gained from the Institute events and from Members at Social Functions within the IDE is invaluable in the progression of the Demolition Engineer”.